These days dual cameras are the trend in the market. Till now you find these dual cameras set up in mid-range smartphones. 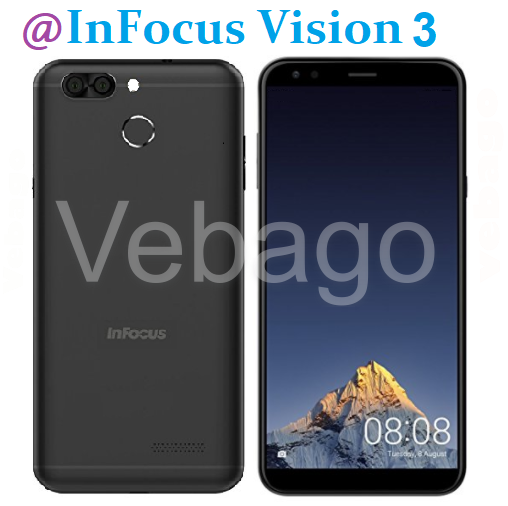 But recently, InFocus has launched a dual camera smartphone named Vision 3 which is a budgetary phone. It comes in Black color option. The smartphone runs on Android 7.0 (Nougat) OS. It is powered by a 1.3GHz Quad-Core MediaTek MT6735H processor with Mali-T720 GPU. It packs a fingerprint reader on the back that unlocks the device with your fingertips. It comes with a 4000mAh battery. It features a 2GB of RAM and 16GB of internal storage, which can be expanded up to 64GB. The InFocus Vision 3 smartphone sports a 5.7-inch 18:9 HD+ display with a resolution of 1440 x 720 pixels and a 2.5D curved tempered glass. The device features a 13MP rear camera with f/2.0 aperture, LED Flash and a secondary 5-megapixel camera with 120-degree wide-angle lens, f/2.2 aperture. On the front, it features an 8MP selfie camera with f/2.2 aperture. Connectivity options on the smartphone include 3.5mm audio jack, FM Radio, 4G VoLTE, Bluetooth v4.0, Wi-Fi 802.11 b/g/n, GPS, USB OTG. The smartphone is now available exclusively on Amazon.in and is priced at Rs. 6999.